Verdigris sophomore Lauren Bulcroft (11) controls a throw-in and powers her way past a Wagoner defender during the second half of Friday's game. Verdigris freshman Maribel Shaddix (7) battles for possession against a Wagoner defender during Friday night's game at Cardinal Stadium. Verdigris sophomore Lauren Bulcroft (11) looks for an opening between two Wagoner defenders during the first half of Friday night's game at Cardinals Stadiums. Verdigris midfielder Aubrey Lechlider corrals a loose ball during Friday night's game against Wagoner. Lechlider scored the only goal of the game, lifting the Lady Cardinals to victory. Verdigris junior Abigail Teal is tripped up by a Wagoner defender during the first half of Friday night's game. Verdigris forward Lauren Bulcroft (11) prepares to launch the ball deep into Wagoner territory during Friday night's game. The sophomore recorded the assist on the game's only goal. Verdigris sophomore Lauren Bulcroft (11) reacts after booting the ball down the field during Friday night's game against Wagoner. Verdigris sophomore Lauren Bulcroft (left) and a Wagoner defender desperately avoid taking the final touch before the ball goes out of bounds during Friday's game at Cardinals Stadium. Verdigris junior Abigail Teal (16) controls a pass as her teammate sophomore Lexy Borgstadt (21) looks on during Friday night's game against Wagoner. Verdigris junior Maddy Barnes (18) cautiously dribbles the ball while a Wagoner defender makes her way over to intercept Barnes' path. Verdigris junior Maddy Barnes (18) prepares to pass before a Wagoner defender has an opportunity to steal the ball. Verdigris senior Paige Weiesnbach (10) launches a throw in over the heads of several Wagoner defenders during the second half of Friday night's game. Verdigris junior Kylee Darden (6) looks to intercept a Wagoner player's path before she can pass during the second half of Friday night's game. 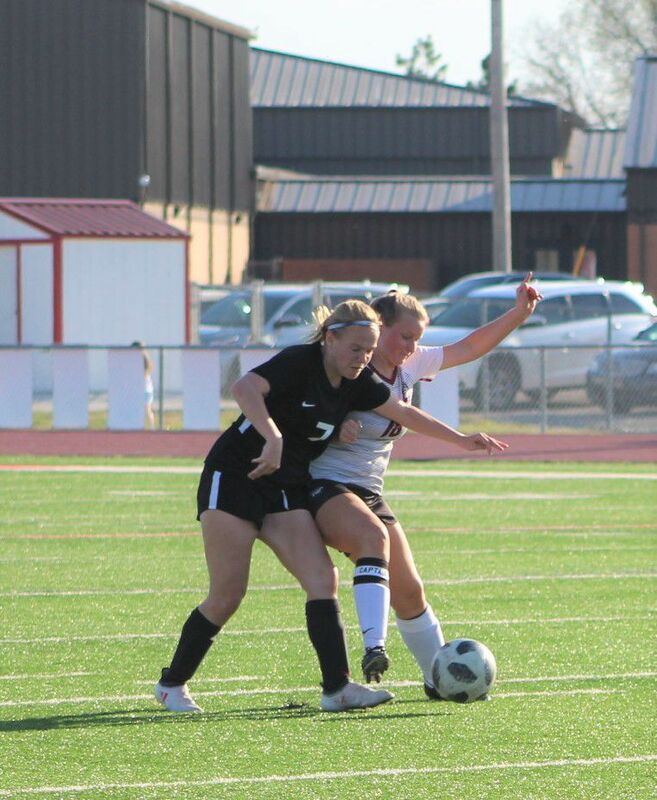 Verdigris junior Kylee Darden (6) braces for impact as a Wagoner player performs a powerful kick with her right foot. Verdigris freshman Trinity Ross makes her way down the field during the second half of Friday night's game against Wagoner. Verdigris senior Paige Weiesnbach performs a throw-in during the second half of Friday night's game against Wagoner. Verdigris senior Paige Weiesnbach performs a throw-in during Friday's game against Wagoner. Verdigris junior Abigail Teal delivers a corner kick during the second half of Friday's game against Wagoner. Verdigris junior Faith Weiesnbach (14) battles for position on an airborne ball during the second half of Friday's game against Wagoner. Verdigris junior Abigail Tea dribbles during Friday's game against Wagoner. Verdigris junior Abigail Teal (16) paces herself past a Wagoner defender during Friday's game. Verdigris junior Abigail Teal (16) passes the ball just before being overtaken by a Wagoner defender during Friday's game. 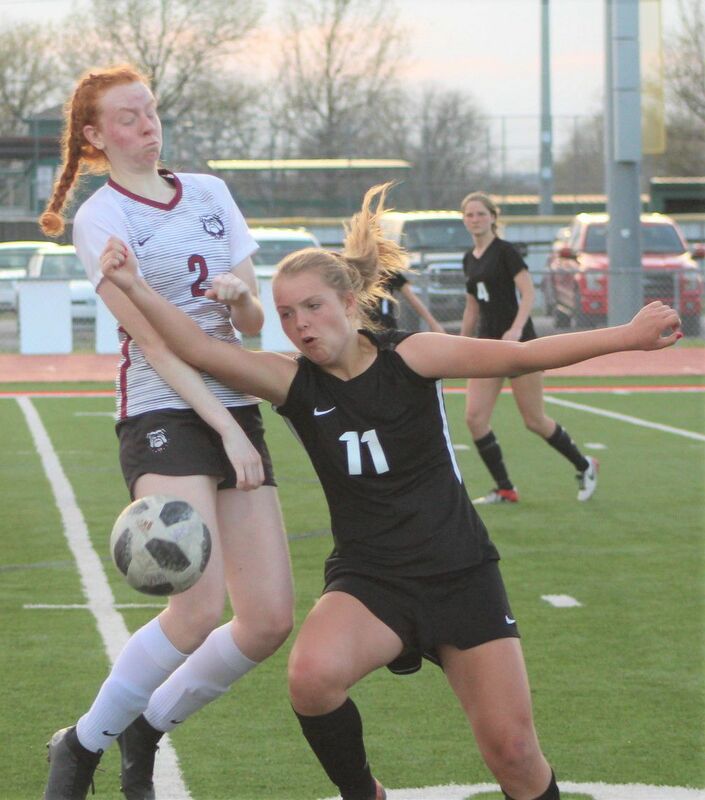 Verdigris sophomore Lauren Bulcroft prepares to take a shot on a goal as the Wagoner goalkeeper does her best to prevent her from doing so. Verdigris freshman Maribel Shaddix (7) prepares to send a kick deep down the field during Friday's game against Wagoner. Verdigris sophomore Lauren Bulcroft (11) attempts to steal the ball from a Wagoner player during Friday's game. Verdigris junior Kayla Darden's shot is blocked by the Wagoner goalkeeper, preventing the Lady Cardinals from taking a two-goal lead during Friday's game. Verdigris sophomore Lauren Bulcroft (11) prepares to chest a throw-in during the second half of Friday's game against Wagoner. Verdigris sophomore Lauren Bulcroft (11) looks for an open shot on goal while being surrounded by Wagoner defender during the second half of Friday's game.